ashlee nicole spills | blog: Drake Covers Complex Magazine. 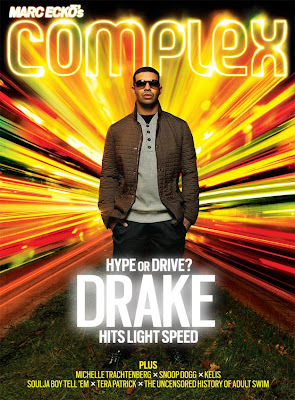 Rapper Drake covers the February/March 2010 of Complex Magazine. Young Money's front man will cover Complex' Magazine's first issue of the year. In the interview, Drake speaks on his loyalty to Young Money, the criticism of the "Best I Ever Had" video, falling onstage, and more. The February/March issue hits stands on February 8, but you can read the full interview here.